Today was Day #11 of Chocolate and Fruit Theme Week. 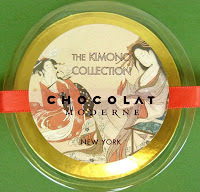 The Kimono Collection from Chocolat Moderne (New York, NY) was a box of five different, attractively stenciled, blossom-shaped, Japan-themed chocolates that I picked up during a recent trip into downtown San Francisco (from Fog City News). The soft, almost caramel-like center of the Peach Persimmon piece that I selected for today contained very subtle hints of peach and persimmon fruit puree flavor. The dark chocolate shell tasted a bit waxy or reinforced -- as molded chocolates often are, to keep their shape. My favorite chocolate of the five-piece set was the Soy - Miso chocolate. The salty/umami flavored ganache was a flavorful complement to the dark chocolate. I hope to include this flavor in a future post if it's still available.